Rangers third baseman Adrian Beltre hates when anyone touches his head. When someone touches his head, a switch flips, and he gets so angry. He's always been like this, and it's always been hilarious. 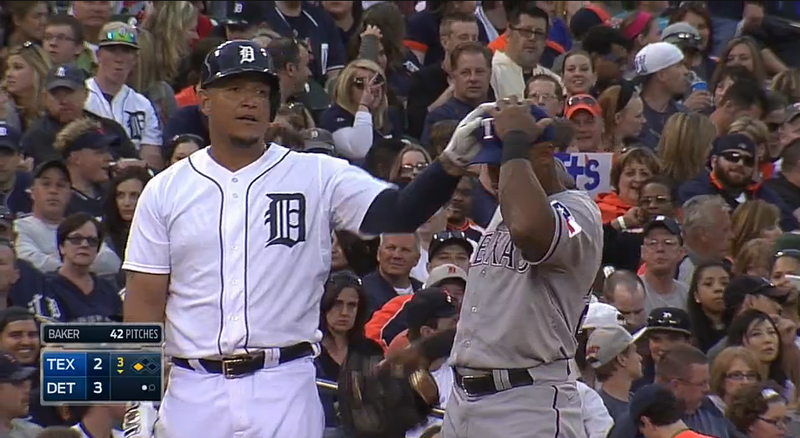 So, when Miguel Cabrera touched his head during a break in play last night, Beltre was unsurprisingly pissed. Cabrera quickly touches Beltre's head, and Beltre shrugs him off. The two chat for a bit, and Miggy goes for another head rub. He should have quit while he was ahead. Beltre retaliates with a crotch tap, Cabrera answers back, and fans get to watch two MLB players try to hit each other in the nuts during a game.